This exhibition brings together paintings, prints and sculptures from some of the most important artists working in the last sixty years. 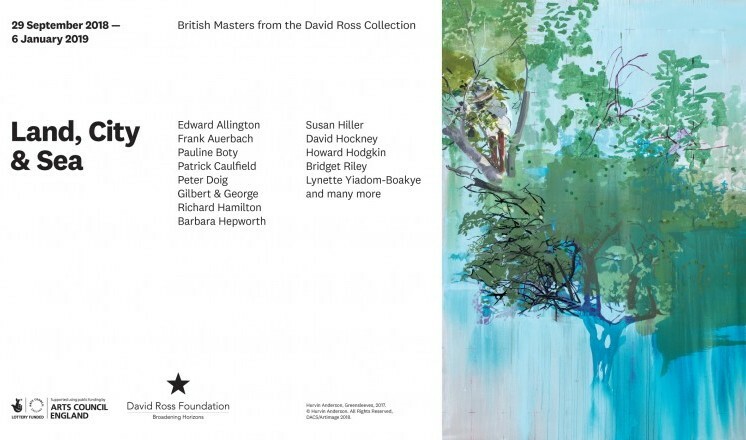 For the past twenty years David Ross, the entrepreneur and philanthropist best known for co-founding The Carphone Warehouse Group, has been building a world-class collection of British art made within his lifetime. Bringing together paintings, prints and sculptures by some of the most important artists working in the last sixty years, Land, City & Sea: British Masters from the David Ross Collection highlights the creative and chronological scope of the David Ross Collection as well as the underlying forces that guide and inspire it. Land, City & Sea explores the many different ways modern and contemporary British artists have responded to the landscape, be it city or countryside, suburb or seaside. The exhibition begins in the cities of the 1960s, with work by artists such as Patrick Caulfield, Allen Jones and David Hockney and moves into more recent decades including more painterly descriptions of urban and suburban landscapes by Leon Kossoff, Frank Auerbach, George Shaw and Jonathan Yeo. Works by Ged Quinn and Tony Bevan introduce unusual and slightly unnerving understandings of the countryside. The sea is explored through the moody modernism of Christopher Nevinson and Keith Vaughan, the sun-kissed world of Pop artists such as Gerald Laing and Derek Boshier, and the contemporary viewpoints of artists such as Susan Hiller, Celia Paul and Peter Doig. In contrast, work by Bridget Riley and Pauline Boty, alongside sculptures by Barbara Hepworth, explore how a sense of place can be conveyed through abstraction, illusion and minimalism. Join Lily Le Brun, the David Ross Collection's curator, on a tour of Land, City & Sea and find out more about the works on show and the wider collection. £7 Adults (Art Fund membership 50% off), £6 concessions, £5 for 16s and under. (Ticket includes exhibition entry). As places are limited, booking is encouraged. Come along and find out more about our gallery invigilators' favourite work in the exhibition. The talk is included in the price of the exhibition ticket.